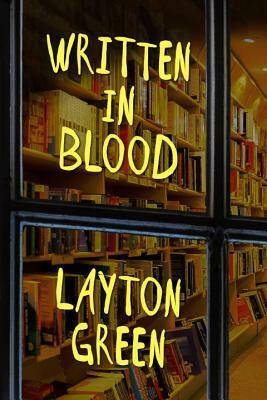 Written in Blood is not your typical crime procedural, but it lived up to every expectation I have of a Layton Green novel. Detective Joe "Preach" Everson has returned to his small hometown in North Carolina after leaving the Atlanta PD under unfortunate circumstances. There doesn't appear to be much need for a homicide cop until the first murder in forever occurs. Now Preach must solve a series of literary murders with an undertrained police force. I loved the literary references. And before you think this sounds an awful lot like a cozy mystery - it is not. I had not read any of the books mentioned. Regardless of what Ari - law student/bookstore worker/new love interest for Preach - says about Dostoyevsky's Crime and Punishment being accessible it still seems daunting (I'm saving it for retirement). However, the other two stories - Edgar Allen Poe's The Murders in Rue Morgue and Agatha Christie's Five Little Pigs - are going on my reading list. There are enough details and discussion of all three stories included in the book that you don't need to have read them (though I'm sure if you have read them, you would be delighted with the details). But back to Written in Blood - what a ride! I couldn't put it down. The twist and turns were well planned and executed. I couldn't guess who the murderer was and the reveal was a huge shock. There is more to Written in Blood that just solving a crime. If you have read any other Layton Green novel, you know they are full of layers and deep thoughts. And this one is no exception. Preach is struggling with his past and the ongoing struggle he has with all the evil in this world. I loved the characters. The descriptions of the town make me want to go there. Green created characters and places that popped off the page. I feel like I could go to North Carolina and find Creeksville and all the people. I see the potential for more mysteries from this town and hope that this becomes a series. Written in Blood is a great crime mystery that I highly recommend you read. Awesome and thanks! Do you have a link?